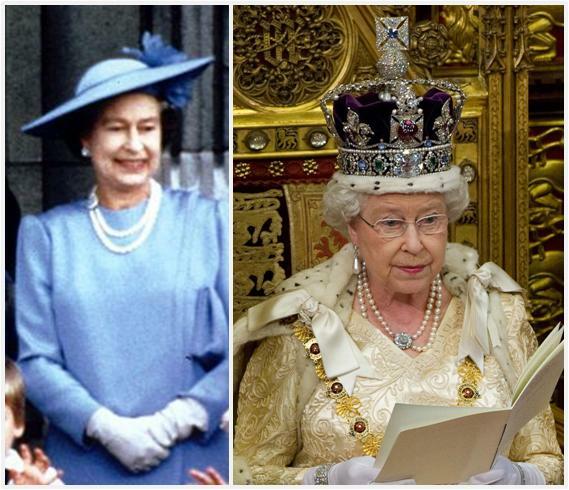 It's impossible to know how many pearl necklaces the Queen has; a pearl lover herself, she's also inherited jewels from the pearl-draped Queen Mary and Queen Elizabeth the Queen Mother. It's hard to tell the difference between the look-alike pieces given the affect lighting, angle, and so on can have on perceptions of color and size. As with the three strand necklaces, I won't necessarily try to make a distinction, but will group them all here. Additionally, it's often very difficult to tell if a necklace is truly a two strand necklace, or is two individual necklaces worn together. The most famous of the two strand necklaces is not a two strand necklace at all, but two single strands that are worn together and referred to together so much, I'm counting them among the double strand necklaces. 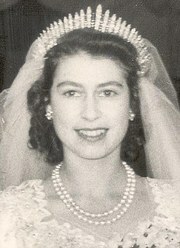 The Queen Anne necklace is the smaller one, with 46 pearls. It is said to have belonged to Queen Anne, the last Stuart monarch. The larger is the Queen Caroline necklace, with 50 pearls, which is said to have been created from the best pearls in the collection of King George II's consort. They were left to the Crown by Queen Victoria. These were both given to Princess Elizabeth as a wedding gift in 1947 by her parents, King George VI and Queen Elizabeth. 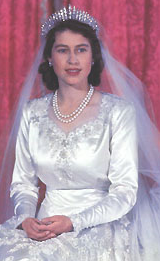 They're the subject of one of the most amusing stories from her wedding day: having decided at the last moment she wanted to wear them, an aide was dispatched to fetch them from St. James' Palace, where they were on display with the rest of the wedding gifts. He had to commandeer the King of Norway's limo, fight through the crowds outside, and then fight for the guards at St. James' to allow him to take them back to Buckingham Palace. Luckily, he succeeded, and they were around the bride's neck for the big day. 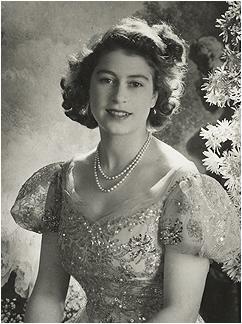 Click here to see the Royal Collection's site on these pearls. Leslie Field notes a two strand necklace made of 222 pearls with a clasp of two rubies in a diamond surround which belonged to Queen Victoria; the pearls previously belonged to Ranjit Singh, ruler of the Punjab, and Victoria received it as a gift from the East India Company after Britain annexed the Punjab in 1849. This was in the Queen Mother's possession, but would have passed to the Queen after her death, and seems a good match for the necklace seen above. Field also mentions the Hanoverian pearls, which came to Britain with King George I and included pearls once owned by Mary, Queen of Scots. Queen Victoria left the pearls to the Crown in her will. Queen Alexandra wore the pearls at her coronation. 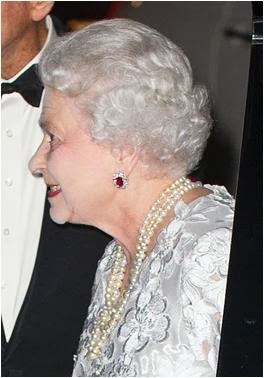 The two strand necklace with diamond clasp seen above may be part of those Hanoverian pearls; it is not often worn by the Queen.